Distributor: Distributed in North America by Touchstone Pictures. Notes: This is loosely based on the life of aeronautic engineer Jiro Horikoshi, designer of the Mitsubishi A6M Zero (Japan's primary fighter plane through much of World War II), with some elements from the life and work of writer Tatsuo Hori, including his story "Kaze Tachinu" ("The Wind Rises"), which itself is partially drawn from the Hori's own life, as his fiancee Ayako Yano died from tuberculosis (as eventually would the author himself). Incidentally, in real life, Jiro Horikoshi would continue to design planes well past World War II, including the NAMC YS-11, Japan's only financial successful homegrown civilian airliner. This review covers both the original Japanese audio as well as the English dub, as the reviewer was able to view both versions on the silver screen. As a boy Jiro Horikoshi dreamed of flight, but his poor eyesight prevented him from being a pilot, so instead, he dreamt of building beautiful planes. To fulfill that dream, he pursues a career as an aeronautical engineer, though he is forced to make difficult decisions as he must navigate a Japan still in transition from its agrarian trappings struggling to become a major world power while ravaged by natural disasters and economic turmoil, and marching inexorably towards war, while also tending to matters of the heart as he falls in love with the terminally ill aspiring painter Nahoko. "Le vent se lève!...il faut tenter de vivre!" "The wind is rising!...we must try to live!" As a lifelong fan of aviation and flight, it may come as no surprise to our readers that my favorite anime film up to this point has been Porco Rosso. The Wind Rises is not just the perfect companion piece to that classic, but rises to the top of any list of Studio Ghibli greats -- this is the heartfelt, bittersweet story of a man whose passion for flight and engineering forces him to make difficult choices in a chaotic world, told with impeccable eye for detail and simple beauty, and with evidently a lot of love from Miyazaki and Studio Ghibli. All too often in anime, we are simply told everything that happens, and Miyazaki here reminds us that sometimes, it is just best to show, not tell. We see things through Jiro's eyes in a way where sometimes we aren't sure whether he's awake or still dreaming -- though this is the one of Miyazaki's films that is most deeply rooted in reality, there is still an immense amount of magic here, not least of which is in Jiro's dreams where he commiserates with the Italian aeronautical engineer Count Giovanni Battista Caproni, who in this film serves as sort of a spiritual guide for our protagonist. We also witness vast swaths of Japanese early 20th century history - the apocalyptic scenes of the 1923 Kanto Earthquake (the harrowing depiction of which has clearly been inspired by both the recent Tohoku quake yet seemingly evoking the legends of supernatural beings stirring beneath the ground), the effects of the Great Depression, and ultimately Japan's militaristic rise and fall. There is also magic in the beautiful romance with Jiro's onetime childhood acquaintance Nahoko, with their playful courtship signified by Jiro's soaring, gravity-defying paper airplanes reaching the impossibly high balcony where she stands, yet tinged indelibly with tragedy as she is laid low by tuberculosis. This is perhaps the greatest indication that the Jiro we get in the film is actually more of a composite character -- in this case, Miyazaki has merged aspects of the life of the writer Tatsuo Hori (from whose works we get the name of this film) into Jiro's life, a creative choice that feels largely seamless and organic, especially given that so much of the documentation of the real-life engineer's life focuses on his work rather than the man himself. At the same time, their quietly desperate, tragic, and beautifully ephemeral romance is unlike much of Miyazaki's previous films, and an interesting wrinkle that sets this apart from his other works as it embraces the Japanese ethos of mono no aware (wistful awareness of impermanence) more wholeheartedly than anything else of his. If anything, this may be the most quintessentially Japanese of Miyazaki's work, even more so than Princess Mononoke or Spirited Away. One of the complaints I've seen from other film reviewers is that the Caproni designs in particular seem so outlandish as to not seem real, but this is actually a case where Miyazaki has completely and utterly outsmarted his critics: believe it or not, the ungainly, palatial nine-winged flying boat you see in the film as Caproni's magnum opus really existed. In fact, most of the designs (even, shockingly, within the dream scenes) have basis in reality -- but this attention to even minute detail extends to things like the evolution of Japan's rail system, and the changes in everyday life as Japan continued its remarkable transition from an isolated, largely agrarian country to a modern industrial power. This also ensures that this movie could never have been made in live-action, given that there is nowhere in modern Japan that can replicate the prewar world in film format the way it could be recreated so painstakingly and seamlessly in animated form. One of the things some viewers may find offputting about Jiro is his singleminded obsession with creating beautiful planes that nevertheless will end up causing great suffering through war, and great personal cost due to first his isolation from others, and then the real physical toll incurred on the love of his life Nahoko. Caproni's question, "Do you believe in a world with pyramids, or no pyramids? ", hearkens to mankind's own admiration for great achievements in the ancient past that came at an equally immense cost. The psychological ramifications of this are indeed addressed in Jiro's dream sequences (the contents of which not only serve as an interesting examination of the aeronautical engineer as artist, but also serve to call back to themes and images previously introduced in Porco Rosso). In the end, Jiro decides to pursue his dreams, not due to moral reasons, but because it's his passion, something echoed by other controversial figures through history (another comparable figure being Wernher von Braun, the rocket scientist who brought great tragedy in the form of the V2 rocket, but great triumph through the Saturn rockets that would launch mankind to the moon). And while some may accuse Miyazaki of glossing over the evils of Japan's imperialistic past in this film, I would argue that a Studio Ghibli film is simply not the avenue to express political views -- if anything Jiro is portrayed as disinterested in serving anyone's agenda - though he certainly expresses concern for free-thinkers and even has a run-in with the Kempeitai (secret police). And with the triumph of Jiro's A5M comes inevitable tragedy, both regarding his wife and regarding that great elephant in the room: the world war itself, handled elegantly and tastefully. Given that this is a highly fictionalized biography set primarily in interwar (1920s-1930s) Japan, the cast of characters we are given to work with is fairly extensive, but may feel very patriarchal. Audiences may experience dissonant chords as Nahoko essentially sacrifices everything to support Jiro, and Jiro's little sister Kayo ends up having to get permission from her father to attend college -- it is good to consider, though, that attempting to apply 21st-century feminist ethics to early Showa-era Japan is fairly blatantly anachronistic, and this movie will therefore err on the side of that era's reality rather than conforming to ours. As for the English dub, I found the voice acting pleasant and natural, with Joseph Gordon-Leavitt and Emily Blunt doing admirably as our lead couple. My favorite casting choices, however, were side-characters - John Krasinski is pleasantly snarky as fellow designer Kiro Honjo, Martin Short is fantastic as Jiro's tough-but-fair supervisor Kurokawa, and Stanley Tucci is excellent as Caproni. The most interesting stunt casting job in the English dub is famous German director Werner Herzog as dissident German engineer Castorp; given the themes of Herzog's own films (uniquely talented people seeking impossible dreams) this feels brilliantly salient. Viewing this again with the original Japanese audio, the standout here is the very surprising male lead - Jiro is played by none other than director Hideaki Anno - well known for Neon Genesis Evangelion, but whose professional relationship with Miyazaki dates all the way back to their work together on Nausicaa of the Valley of the Wind. Though not known for his voiceover work (almost completely otherwise in the form of cameos), Anno's nuanced, understated performance really works well for the role. Casting is otherwise, uniformly excellent; the only remotely questionable casting choice here would be the still-serviceable Stephen Alpert as Castorp, with a noticeable American rather than German accent: a detail perhaps easier recognized by Western audiences than Japanese ones. Leaving the best for last, it almost goes without saying that this film is a visual and aural achievement, complemented by yet another excellent Joe Hisaishi soundtrack. Every flight scene feels like a love letter to aviation itself, and each plane comes to life as if it were a living being, each engine sounding more like a song than a machine. This also holds true for more visceral scenes, such as those involving the earthquake (a scene that will give me the shakes for the conceivable future) as well as when prototypes fail (though at least, this being a Miyazaki film, we get to see the parachutes that signify that the pilots turn out okay). Since we're really seeing this through Jiro's eyes, in a sense, the visuals often make it seem like the boundary between dreams and reality is a blurred one at best (a topic which I'm sure could be discussed on end academically by film critics more talented than myself). 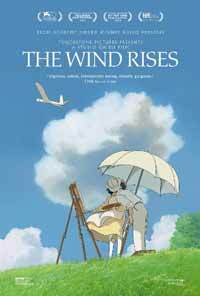 In summary, as a spiritual successor to Ghibli films of the past, The Wind Rises is a worthy addition of the oeuvre, and regardless of whether or not this signifies Miyazaki's retirement or not, counts as a high note in an already legendary career. Recommended Audience: The scene involving the 1923 Kanto earthquake is utterly gut-wrenching (particularly for anyone who's ever experienced an earthquake). There are some violent images involving war, though people are never shown getting killed onscreen. Nahoko experiences symptoms of tuberculosis (including a fairly terrifying lung hemorrhage that leads to her coughing blood onscreen). Nahoko's invitation to Jiro to come to bed on their wedding night carries subtle implications of what else might have happened after the lights went out. All in all, best for teens and up due to complicated adult themes and several intense scenes.